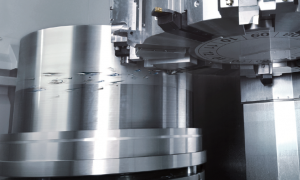 The MEGATURN SMART Series of vertical turning centers brings powerful cutting performance, user-friendly CNC programming and high productivity to heavy-duty machining applications involving large workpieces. 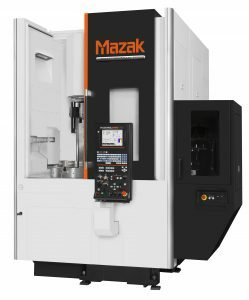 With model configurations that include rotary tool milling capability (M) and second turning spindles (S), the series also provides multi-tasking and DONE IN ONE® operations for shops seeking maximum versatility. The machine base is designed for heavy duty cutting by using structural analysis to ensure the maximum rigidity. By utilizing roller linear guides on the X-and Z-axes, not only is high rigidity realized but smooth cutting is also ensured even at high speed feedrates. Because of these modifications, the high strength and rigidity is maintained without the presence of a VTL Crossrail. 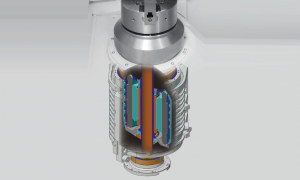 The integral spindle/motor uses no gears or belts which can cause vibration during machining. The smaller number of parts in the headstock assembly provides high-reliability. The system eliminates interference with adjacent tools for extremely convenient tool setup. By increasing the number fo tools that can be stored, permanent set tooling that meets the requirements of a wide variety of workpieces can be used. 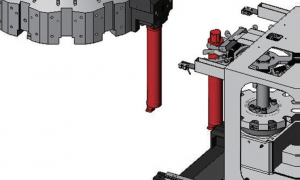 Higher productivity is realized by minimizing tool setup when changing workpieces. Demonstrated above, the turning tools (including long boring bars) can be automatically stored in the adjacent tool magazine.